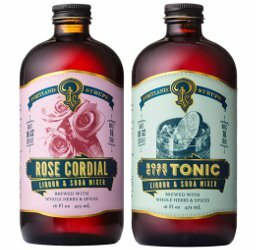 From Portland Syrups, Rose Cordial ("Fragrant, whole dried rose blossoms and petals are slow-brewed in stages with dried rose hips, to capture the flower’s essence at several stages of its expression. It is sweet and tart with a subdued but complex floral character, and is extremely versatile. Wonderfully refreshing on it’s [sic] own, or add clear liquors for an especially delightful cocktail.") and Rose City Tonic Syrup ("Portland's own House Spirits approached us to create a tonic that paired with their award-winning Aviation gin. This authentically-brewed whole-ingredient tonic, made with genuine cinchona bark, features a delicate floral layer that supports but does not compete with Aviation's spice roster. Cinchona, the bittering bark from which tonics get their quinine, delivers a complex, gently astringent tonic “bite.” This makes the driest gin and tonic you'll find — simply stir it with a bit of sparkling water prior to building your drink."). $14 each for 473 ml. These look delightful! My husband loves a good Gin & Tonic, I should look into this! I bet the Rose would be lovely with soda and a splash of pomegranate. There are so many great tonic syrups now, it’s amazing…and they’re so nice to have if you don’t drink much, since you don’t have to waste half a bottle of tonic water every time. Robin, this just means you aren’t drinking the right number of G&Ts Didn’t you know you have to keep drinking until the tonic water is gone?? And I used to have no trouble with that, LOL…now, I might have a couple drinks a week and I might have none. In the last 2 weeks, I’ve had exactly 1 drink. I have a friend who loves to play bartender and these lemmings are like a year’s worth of gift ideas! Oh good!! I wish some of these “fun” products had been around when I drank enough to play bartender. Just sent a link about these syrups to a friend!